What Facts Should I Know about Hormone Replacement and Osteoporosis? Hormones are produced by glands in our bodies. They are chemicals that have specific effects on different parts of our bodies. For example, the ovaries produce estrogen that enters the bloodstream and has effects on the uterus and other organs and tissues. As we age, our bodies start to produce smaller amounts of hormones, particularly reproductive hormones such as estrogen and progesterone in women and testosterone in men. Does low estrogen cause osteoporosis? Eventually, production of reproductive hormones declines, and in women, the decline results in menopause, when menstruation stops. In women, bone loss occurs rapidly in the perimenopausal years. 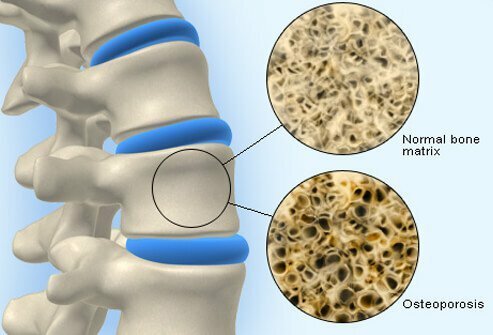 Bone loss can eventually lead to osteoporosis (or thin bones). Without prevention or treatment, osteoporosis can progress without pain or symptoms until a bone breaks (fractures). Fractures commonly occur in the hip, spine, and wrist. Osteoporosis is the underlying cause of many fractures annually. Osteoporosis is a major public health threat. Half of women and a quarter of men older than 50 years will have an osteoporosis-related fracture in their lifetime. Osteoporosis is also a global problem. Worldwide, one third of women aged 60-70 years and two thirds of women 80 years or older are estimated to have osteoporosis. In several European countries, women older than 45 years spend more time in the hospital for osteoporosis-related problems than for any other disease. In the next 50 years, the number of hip fractures for both men and women will more than double. According to the World Health Organization (WHO), osteoporosis is the second leading healthcare problem after cardiovascular disease. In France, Germany, Italy, the United States, the United Kingdom, Spain, and Japan, fewer than half of women with osteoporosis are diagnosed. 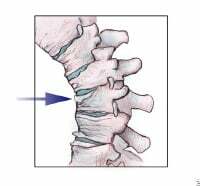 The arrow indicates vertebral fractures. Menopause occurs when reproductive hormone levels have dropped enough to cause menstruation to stop. In most women, menopause happens between the ages of 48 and 53 years. Many women experience early signs of menopause, or perimenopause, beginning at around age 45. Surgical menopause occurs when a woman undergoes a complete hysterectomy, which is surgery to remove the uterus and ovaries, or an oophorectomy, which is surgery to remove the ovaries alone. Some of the conditions that cause a woman to have a complete (or total) hysterectomy or an oophorectomy include severe endometriosis, uterine or ovarian cancer, or persistent uterine fibroids. Regardless of whether a woman has a complete hysterectomy or an oophorectomy, the absence of the estrogen-producing ovaries causes menopause. Surgical menopause can occur in women at any age if they undergo a procedure to remove the ovaries. Chemical menopause occurs when women undergoing chemotherapy or radiation treatment for certain kinds of cancer or other conditions experience menopause. In some cases, chemical menopause reverses and the body will begin producing premenopausal amounts of estrogen once more. Bone is made mostly of collagen, which is a protein that is woven into a flexible framework, and calcium phosphate and calcium carbonate, which are minerals that add strength and harden the framework. Even though it is mostly made of protein and minerals, bone is living growing tissue. Throughout the lifetime, old bone is broken down (a process called resorption) and new bone is added to the skeleton (formation). When more bone is broken down than is deposited, bone loss is occurring (see Prevention of Osteoporosis and What is Bone Loss? for information on factors leading to bone loss). Bone is added fastest during childhood and teenage years. As a result, bones become larger, heavier, and stronger (denser). Bone formation continues until the peak bone mass (maximum solidness and strength) is reached. Peak bone mass (or bone density) is reached around age 30. After age 30, bone resorption slowly begins to exceed bone formation. This leads to bone loss. Bone loss in women occurs fastest in the first few years after menopause, but bone loss continues into old age. Bone loss occurs fastest during and after menopause because the rate of bone loss increases as a woman’s body stops producing estrogen, which occurs during menopause. Estrogen (a reproductive hormone) is important for bone growth and strength because it works with the cells responsible for forming bone (called osteoblasts). Estrogen works with these cells to stimulate the substances in the body that encourage bone growth. The end result is that as estrogen levels decrease in menopause, the substances in the body that cause bone to be built decrease. Consequently, bone is formed more slowly. Whenever bone is broken down faster than it is formed, bone loss occurs and can eventually lead to low bone density (osteopenia) and osteoporosis. Hormone replacement therapy (HRT) and estrogen replacement therapy (ERT) were initially indicated for treatment of the symptoms of menopause, but they are now approved for both prevention and treatment of postmenopausal osteoporosis. This is because declining estrogen and progesterone levels do not just affect a woman's reproductive capabilities; they also cause bone density to decrease and the risk of fractures to increase. By taking estrogen either as ERT or as HRT, bone loss can be slowed and bone density can even be regained. ERT is available in a variety of forms, such as oral tablets or topical patches applied to the skin, and can be made from a mixture of different naturally occurring estrogens or from a single type of estrogen. ERT only replaces the estrogen that stops being produced by the body during menopause. Estrogen therapy taken alone (ERT or unopposed estrogen) can increase a woman’s risk of developing cancer in the uterus (cancer of the uterine lining, called endometrial cancer).For women who have not had their uterus removed (have not had a hysterectomy), doctors prescribe an additional hormone called progesterone, or synthetic versions called progestins. Progesterone in combination with estrogen is called HRT. HRT works by replacing both estrogen and progesterone levels to mimic the levels that were in effect before menopause, and it reduces or eliminates the risk of endometrial cancer in women who have not had a hysterectomy. Why do women need progesterone? Unlike ERT (estrogen alone), HRT is a combination of estrogen and progesterone. The progesterone in HRT is important because it prevents the unchecked growth and buildup of the uterine lining (which occurs when only estrogen is used), and this greatly reduces, and may even eliminate, the increased risk of uterine cancer seen in women who take estrogen alone or unopposed by progestin. Therefore, women who have a uterus (have not undergone a hysterectomy) should generally be prescribed HRT rather than ERT. Doctors perform a hysterectomy to treat conditions that involve the uterus, such as severe endometriosis, uterine or ovarian cancer, or persistent uterine fibroids. A hysterectomy is a kind of surgery that involves removing the uterus. In women who have not had a hysterectomy, HRT is recommended because estrogen alone (ERT) increases the risk of uterine cancer. If a woman has had a hysterectomy, and in some cases if she is only going to be taking estrogen for a short period of time (less than a year), her doctor may prescribe ERT. A woman should talk to her doctor about HRT and ERT. Like any medication, HRT can cause a number of unwanted side effects. Fortunately, most side effects are rare, and even the more common ones tend to disappear after the body adjusts to the hormones. A woman should always note how she feels after taking a new medication. In general, she should consider calling the doctor if she experiences something that is severe; is moderately painful or uncomfortable and does not seem to be going away; or is mild, yet noticeable, and lasts for an extended period of time. If she does not feel right after taking a new medication, she should let the doctor know. The long-term effects of HRT are being studied, and new information is becoming available. Doctors are now recognizing that lower doses are likely to be effective and that lower doses seem to significantly reduce the likelihood of side effects. Because HRT is a combination of two different hormones (estrogen and progesterone), the side effects a woman can experience may be caused by either one, or by a combination of both. Some doctors give the estrogen and progesterone as two separate supplements rather than as a combination pill in order to facilitate the adjustment of one or the other to minimize side effects. Sometimes using different forms of the compounds, such as a cream or a patch applied to the skin instead of a pill, can also reduce side effects. Keep in mind that a mild side effect may just be a sign that the body is getting used to something new. For years, many women with, or at risk for, osteoporosis have been prescribed HRT or ERT. HRT and ERT provide a number of benefits, but doctors are learning more and more about the risks associated with taking these medications. Recent findings from the Women's Health Initiative (WHI) study have shown that taking HRT for extended periods of time can increase a woman's risk of breast cancer and cardiovascular disease. Another recent study, this one sponsored by the National Cancer Institute, found that ERT might increase the risk of ovarian cancer when taken long-term. The WHI study recently demonstrated that at least one form of HRT (estrogen plus progestin) was associated with a small increase in the risk of breast cancer. This increase in the risk for breast cancer is somewhat controversial; some studies conclude that a risk exists, while others find no increased risk. Evidence indicates that taking HRT for more than 5 years can increase the risk of breast cancer. It is still not known whether estrogen alone carries the same risk. If a woman is concerned about the risk of breast cancer, she should talk to the doctor about her individual lifetime risk. If taking HRT, monthly breast self-exams should be performed and the doctor should be contacted immediately if any unusual lumps or discharge is noted. Women who are aged 40 years or older should be sure to have a yearly mammogram and manual breast exam by a doctor. A large study from the National Cancer Institute (NCI) has recently indicated that long-term use of ERT may be associated with a slight increase in the risk of ovarian cancer, especially if it is taken for 10 years or more. It is not yet clear whether HRT has a similar risk. Taking HRT can increase the risk of cardiovascular problems such as stroke, heart attack, and blood clots. The risk of heart attack and blood clots is most noticeable in the first year of taking HRT, while the risk of stroke gradually increases after taking HRT for 2 or more years. Whether estrogen alone (ERT) carries the same risks is unclear. Other smaller studies have found that ERT may provide some cardiovascular benefits. However, because of the risk of uterine cancer, women with an intact uterus should not take estrogen alone. In October 2004, the United States Surgeon General issued the first-ever report on bone health. The report warned that by 2020, half of all American citizens older than 50 years will be at risk for fractures from osteoporosis and low bone mass if no immediate action is taken by individuals at risk, doctors, health systems, and policy makers. HRT and ERT are one option women should consider in their plan for preventing osteoporosis. The estrogen in both HRT and ERT is the ingredient that helps strengthen the bones. The body gradually stops producing estrogen during menopause, which leads to bone loss and possibly osteoporosis and broken bones (fractures). By taking estrogen, a woman can slow bone loss and even regain bone density because estrogen works with the body's bone-building cells to stimulate bone formation and slow the process of bone loss. The risks of HRT sound scary, but keep in mind that a woman's annual individual risk is still relatively small. Also, these studies focus on the long-term risks and benefits and not the short-term risks and benefits of taking hormones, such as osteoporosis prevention. If a woman has been taking HRT or ERT, she should talk to the doctor about her relative risks and treatment goals. Doctors should prescribe any estrogen therapy for osteoporosis only for the shortest period of time possible. ERT and HRT used to prevent osteoporosis after menopause should only be considered for women at significant risk of developing osteoporosis, and nonestrogen medications should be carefully considered (see Treatment of Osteoporosis and Understanding Osteoporosis Medications for more information). "Postmenopausal hormone therapy in the prevention and treatment of osteoporosis"
Did you receive hormone replacement therapy? Please describe your experience. Did you experience side effects from hormone replacement therapy? What were they?